I’ve been thinking about dolls. Sitting in my living room, wondering what or whom to write about in my blog, my eyes kept focusing on the three dolls perpetually resting in an old Canadiana antique baby sleigh. My Godmother, Mayda, from New York, sent me Mafoo, my first doll. This rubber girl has aqua eyes that open and close, a molded bun that won’t even budge in a hurricane, and dimples on her knees. If you peek under her dress she looks anorexic now because all the air has come out of her. Sleepy Baby has a hard plastic face and a spongy body. In the 49 years that I have owned her she never once opened her eyes, at least not while I was looking. I used to cuddle her and fall asleep. Fuzzy on the other hand, kept me wide-awake at night. I remember being in bed and making her dance in the dark, tossing her stringy hair all over the place like a Go-Go dancer. I worked her so hard that I had to bind her dislocated neck with a leather grip that I took off the handle of my Dad’s tennis racket. Mafoo, Sleepy Baby and Fuzzy are the survivor dolls that have followed me. There used to be countless others. When I was growing up in St. Jean, Quebec, we used to have a genuine horse drawn sleigh in the basement. Much to my dismay we did not own a horse to go with it. My mother had painted the sleigh black with gold trim and had upholstered it in cherry red corduroy. 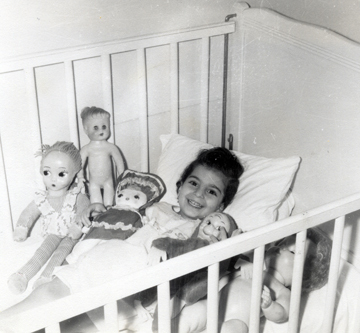 It was inundated with my dolls–dolls that walked, slept, peed, and fed my imagination. Being an only child at the time, I enjoyed playing in this haven of surrogates. At times these children became my orphanage. Other times I became one of them and we would ride together as our team of horses galloped us off to the North Pole. We never did find Santa Clause’s house, however, Santa inevitably found our house on Christmas Eve. He always dumped the presents next to the sleigh, a convenient spot since it was located next to the chimney. 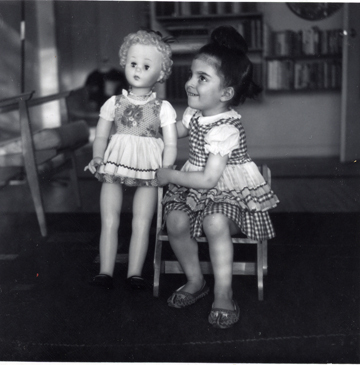 Through the years many dolls have come and gone from my life. Some have stayed, albeit in a plastic box in the crawl space of my basement. 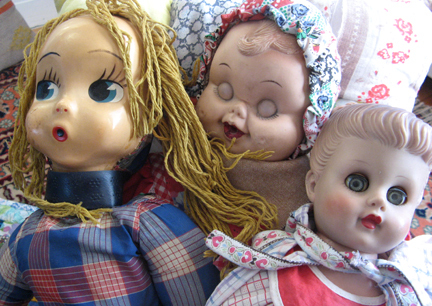 Today, for the sake of this blog, I contorted my body into Cirque de Soleil postures as I reached into the corner of my crawl space to dig out what remains of my diminished family of dolls. I found Jenny the redhead who would perennially crop up from my birthday cake, atop a cascade of chocolate icing. I discovered a nameless doll I sewed when I was in my twenties, back when I had that precious commodity called free time. I recovered a faded and barren matrioshka, Russian nesting doll. I found my itty-biddy plastic girls I bought in a dusty market in a Bolivian village, dolls with bottle cap faces from Cappadocia, Turkey, and dolls from Brazil, still in their never-opened original plastic bags! What do dolls have to do with art? Everything. I am not referring to the art of doll making. I am thinking about the act of playing with dolls. As a child I would invent countless scenarios with my dolls, appropriate them with an array of emotions, in other words I expressed myself through them. These were not scenarios that I’d sit down and script. They happened on their own, and because I was never aware of being the instigator of these stories, these dolls appeared all the more real to me, with a will of their own. When I create my prints I have a similar, intuitive approach. Yes, I may start with drawings before attacking my plate but at the sketching stage I try to be as free as I can, shutting off my personal sensors. When I transpose my drawn ideas to the plate, I continue the state of play as I rip the cardboard plate and glue on various materials. For my latest series, Animal Instincts, I cut out cardboard animals that became my plates. 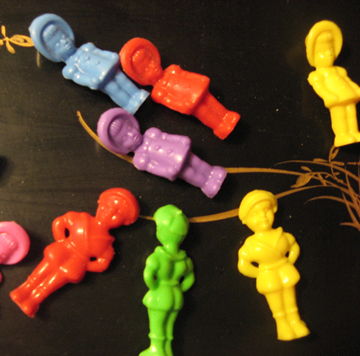 Several times as I manipulated my horses, wolves and cats, I remembered playing with paper dolls as a child. When I juxtapose my animals at the printing stage, again I am playing as I invent scenarios and create relationships. 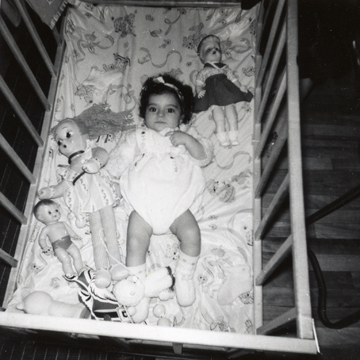 When I look at my dolls now they don’t seem as alive as they used to. In fact they look dilapidated and smell musty, which is why they have been relegated to plastic bins. I really don’t need them anymore. Sometimes I do get the urge to play, but never with dolls. One of these days I want to make beaded necklaces, another activity reminiscent of my childhood. My husband recently bought me tons of beads, enough to string a necklace from here to Patagonia. Now all I need to do is make free time, an art I have yet to master! 13 requêtes. 0, 057 secondes.